This time we're looking at the muzzle energy produced by the Beeman model 1073 air rifle, also known as the RS2 and Grizzly X2. Muzzle energy represents the "hitting power" of the air rifle. It's a very different thing to muzzle velocity. A heavy pellet shooting slowly may have a higher muzzle energy than a light pellet shooting much faster. As an extreme example, a cannon ball traveling at walking pace may demolish a stone wall, yet a (much lighter) ping pong ball traveling 1,000 times faster will simply bounce off the same wall. In my opinion, muzzle energy is a much more meaningful measurement of air rifle performance than muzzle velocity, as muzzle velocity is a more or less meaningless number unless the pellet it's achieved with is also specified. 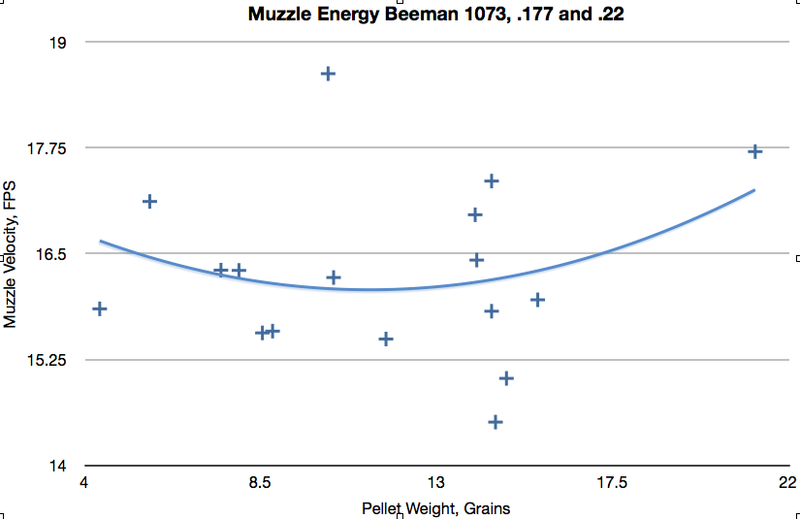 As you can see from the chart here, the Beeman produces somewhere between 14.5 and 18.5 ft/lbs of muzzle energy - which is about what would be expected. A typical muzzle energy, attainable by a wide range of pellets, is around 16.5 ft/lbs, as the line of best fit shows. The data that produced this chart is listed below. Interestingly, the highest three muzzle energies were produced in .22 caliber. 18.6 ft/lbs muzzle energy was achieved using light .22 caliber Stoeger X-Speed lead-free pellets with a weight of 10.22 Grains. 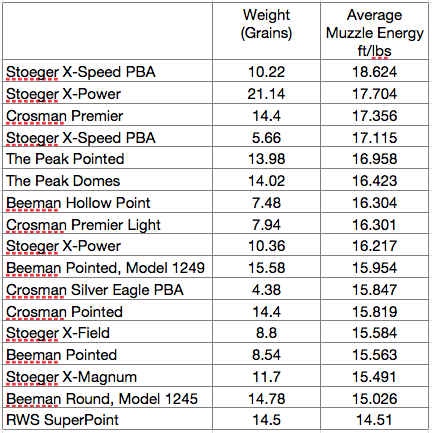 17.7 ft/lbs muzzle energy came from very heavy .22 caliber Stoeger X-Power pellets with 21.14 Grain weight. 17.3 ft/lbs was achieved by .22 caliber Crosman Premier domed pellets weighing 14.4 Grains. The pellets with the highest muzzle velocity - Stoeger X-Speed lead free pellets in .177 caliber - weighing a mere 5.66 Grains were next highest with 17.1 ft/lbs. This proves that the lightest pellets - with the highest muzzle velocities - do not necessarily translate into the highest muzzle energy. 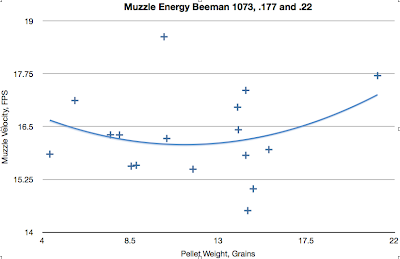 So, a final conclusion is that the Beeman 1073, Grizzly X2, RS2 typically gives about 16.5 ft/lbs of muzzle energy in both .177 and .22 calibers, although it will tend to produce higher muzzle energies in the larger caliber, depending on the pellet being used. For the price being offered at Walmart for this air rifle. It's a bargain! IM STILL CONFUSED ABOUT THE DIFFERENCE BETWEEN & THE GRIZZLY X2? "PLEASE HELP"
Yes, I know, it IS confusing! Actually the 1073 and the Grizzly X@ are the same gun just with slightly different names. If you go to Walmart and buy a dual barrel Beeman air rifle, you'l get this gun, whatever it says on the box! Where did you find .22 cal Stoeger X Speed pellets in 10.22 grain??? I've looked everywhere. Apologies, my error! Stoeger X-Speed pellets are 10.03 grains in .22 caliber. I mis-typed 10.22 in this post. Archer Airguns does sell Stoeger X-Speed pellets and they give excellent results in both .177 and .22 calibers.